I kindly received The Definition of Icing in exchange of an honest review by the author. Aven Ellis is back with a new installment in the Dalls Demons Series! I was over the moon with the first release Waiting for Price Harry (read my review here) so I was pretty much feeling like this when I received an early advanced reading copy by Aven herself. I finally got to read it, and it did not disappoint. In fact, it exceeded my high expectations. I thought I could not fall in love any more with the series as I already am but I did. In her story, Aven Ellis has created a wonderful story about two people who fell in love when they least expect it. Nate Johansson, a drop dead gorgwous hockey star, has recently been traded to Dallas from Minnesota and while he has left everything behind, it was a fresh start that he desperately needed. Having been betrayed before, Nate isn't looking for a relationship, let alone love. He certainly doesn't expect Kenley Hunter to come into his life. Kenley is a a confident businesswoman who wants to be known for her brains rather than her beauty. Kenley intends to show people how she is beautiful inside making chocolate in amazing shapes and with amazing flavors. Both of them had been hurt in previous relationships, and just wanted to be friends. But the chemistry and flirting made that impossible somehow. Can Nate and Kenley overcome their fear and insecurities about love/relationships and let go of their past? Where do I even begin? I can't even formulate words to describe this book. Aven Ellis has done it again! She has outdone herself and created another fabulous read in the Dallas Demons Series. I loved this book beyond any others that Ellis has written. Her books, especially this one, was just right up my street. The author was able to grasp me from the first page until the very last, leaving me wanting so much more! I totally lost myself in this story and found it a wonderful escape. I lost track of time, read it in two sitting and adored every minute of it. This book has it all. It's a fresh and amazing read that will have you adoring it's every twist and turn. Avens writing had me flicking through the pages on my kindle, desperate to see what was going to happen next. If you know Aven personally (even if it just via Twitter) you recognise she brings so much of her own personality, interests and things she is passionate about into her stories. This makes her books a true gem. There’s a range of fantastic characters throughout the novel. Kenley, our maincaracter, is a great character inside and out. I connected to her in so many levels so it was so easy to like and releate to her. You can't do anything else as to fall in love with Nate as from the first moment you read of him. He knows how to treat a woman. Nate is so my type of guy! Short dark hair, espresso colored eyes, tattooed arms, a total sweetheart who is loyal to his family and friends with a smile that will make any girl keens go weak. I loved him. No wonder I have such high expectations in boyfriends and releationships. There wasn’t a single thing that I didn’t love about The Definition of Icing. Aven’s style of writing is wonderful. I adore her sense of humour and how it was translated onto the pages. She brings in some hilarious one liners and scenarios that will have you giggling. When I was reading it on the train I had to put myself together not to burst out laughing sometimes. Especially Cici, Kenleys mother, cracked me up the most. She was fantastically hilarious! One of those things I admire about Avens novels that she knows how to make the reader feel like they're part of the story. Everything is so real and magical. I loved watching how Kenley and Nate build up their relationship. They shared many heartwarming moments that I read most of this book with a grin plastered on my face. 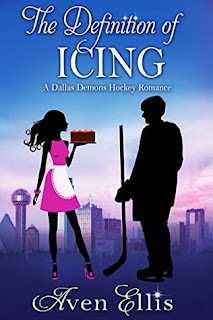 Anyone who is a lover of romance, hockey player and memorable characters, will adore this book! For all you Aven Ellis fans and those who have yet to discover her excellence, this book is a definite must read. The Definition of Icing deserves nothing less than 5 wonderful cupcakes!